If you're planning a car trip, be sure to take along travel Bingo cards for the kids. The car ride will be a breeze when everyone is busy finding the pictures on the Bingo cards! 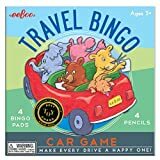 Travel Bingo cards have been around for decades, and for this reason, many people have forgotten about this simple but fun game to take in the car. But let me tell you, my kids loved travel Bingo and so do my grandkids. Keeping a look out for an airplane or a stop sign or any of the other everyday objects then sliding the little plastic cover over that item is fun. As with any toy or game, getting the right version is key. You want your child to be successful so find the right travel Bingo cards for their age. These Bingo cards are perfect for short and long car rides. Use them at home to get kids familiar with the concept of finding shapes like circles, triangles, squares, and more. Travel Bingo cards with bright colors offer another fun way to make the drive go smoothly. Make getting there fun! Family vacations are all about spending time together. Little kids can be coaxed into playing travel Bingo easily. Older kids may think it's totally lame but you know your kids. Is there an incentive you can use for playing along? Maybe winner can choose where the family eats the next meal or other fun stop along the way. If you play along using your own Bingo card (that is, if you're not driving! 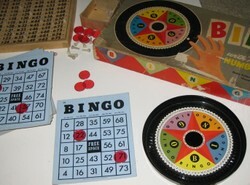 ), even older kids will enjoy travel Bingo. Everyone starts at the same time. Decide how many miles you'll play each game, letting the driver keep track. Everyone plays the same game (see different ways to play car Bingo below). Have You Ever Played Car Bingo? No, we haven't but it sounds like fun! If you want to play the silent version of auto Bingo, anyone who sees an object on their card can push the colored plastic over that image. This way, if someone isn't paying attention, they might miss the cat or silo or airplane. For the other more common version of car Bingo, the first person to see an item on their card says that item out loud. Only they can cover that image on their Bingo card. Another option is to play license plate bingo. When traveling the summer, this can actually be a great way for kids to learn about other states with all the travelers sharing the road with you. Have You and Your Kids Played Travel Bingo? When you're looking for ways to entertain your child and sneak in a little education, too, take a look at all that National Geographic offers for kids. by Peggy Hazelwood. Making rock kits for kids is a great way to introduce geology and rock identification to children. You can make your own or buy rock kits already made. Have you noticed cell phone towers in your area? Do they look like cell phone towers or do the cell phone towers look like trees? Check the cell phone tower locations to see.